Sad to say that it's marriage no more for Mary Bono Mack, 51, and her husband Connie Mack, 45. 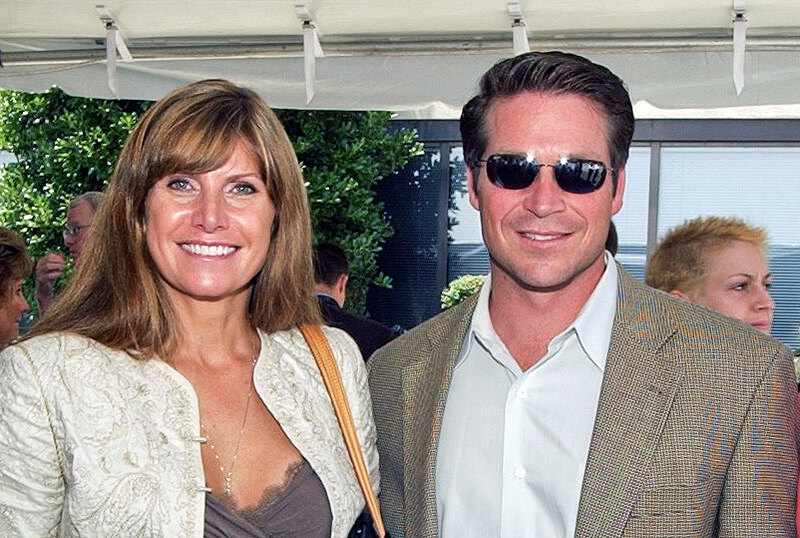 The handsome couple has called off their vows, but according to KMIR-TV "still remain on friendly terms." Both are former Republican members of Congress, and both were defeated in the 2012 elections. Mack, from Florida, and Bono, from California, were one of Washington's hottest couples, being seen together, most notably on the red carpet of the Palm Springs International Film Festival. Mack was defeated by Dr. Raul Ruiz, who currently represents Palm Springs, other desert cities and a bit of the gerrymandered Inland Empire. 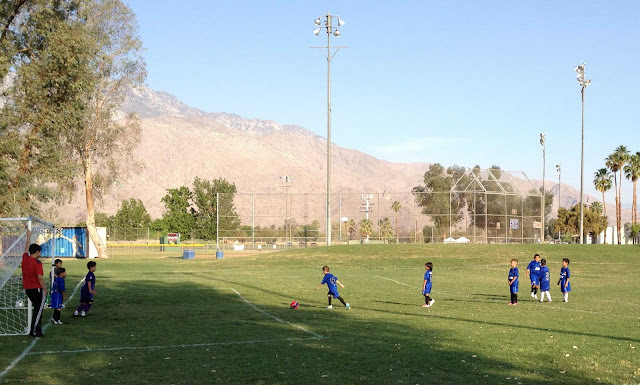 If you want to exhaust yourself on a hike, go to the Palm Springs Art Museum, walk into western parking lot and head straight toward the mountain. You'll run into the Museum Trail trail head, which is the beginning of a hike that's just about as vertically up as you can get. Of course there are switchbacks to help you navigate your way up. Don't hike this trail on a summer afternoon, as it's bound to kill you within a few hours. I kid you not. Again, do not hike this trail on a summer afternoon, no matter what the weather is. It's always well above 100 degrees at that time of year and if you walk upward for just a few minutes, you'll find yourself passing out. 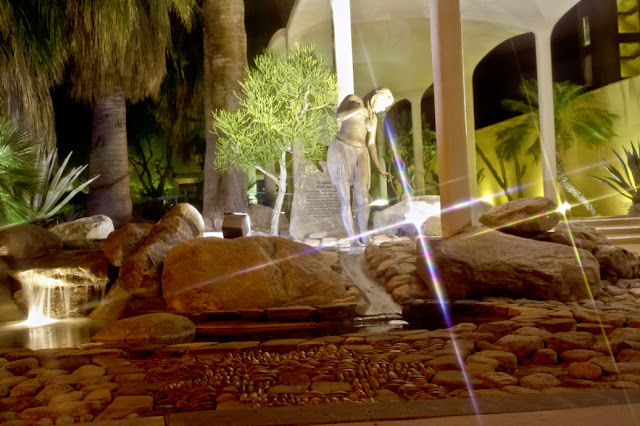 To get to the Cathedral City fountain, just drive down Dinah Shore to Cathedral City Canyon Road, then take a right. Keep going forward until you get to Highway 111. Look to your left and the fountain will be visible in the center of the downtown plaza . All of the desert it's happening--yellow, blue, red and purple. The cactus flowers are blooming. After the first few 100+ degree days, the cactus flower first puts out a gnarly bud, which opens up to a fascinating flower filled with pollen and petals. 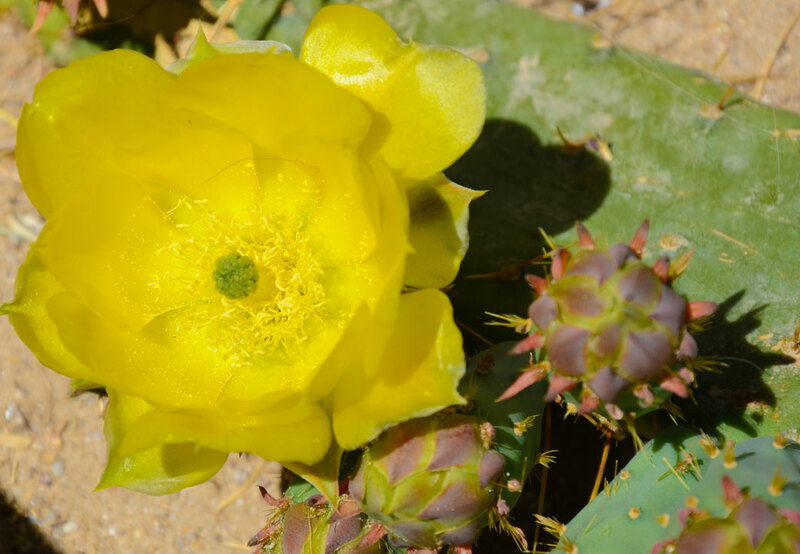 The cactus flowers are blooming mostly in people's desert gardens with a few blooming out in the desert itself. Take a walk in Palm Springs and you'll see the cactus flowers everywhere. 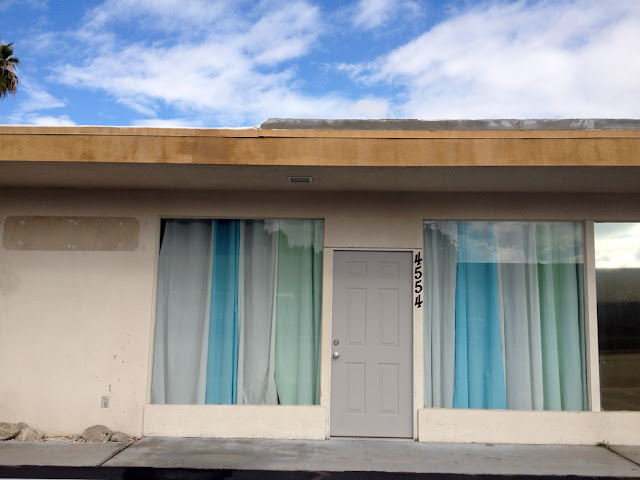 Lovely streamlined building on El Cielo near the Palm Springs Resort Port. Note that this is a scanned film image. It was shot over 10 years ago. As I prepare for a roofer to arrive, I contemplate the type of roof I want. In less than an hour, I'll have an idea of the cost to redo the roof of my ranch home (home built in 1960s) in Palm Springs. This is my second estimate. One more to go. Currently my roof is bad shape. It's got two flat portions and one arch, a quirky combination of slopes and plateaus, that is, to be honest, annoying. 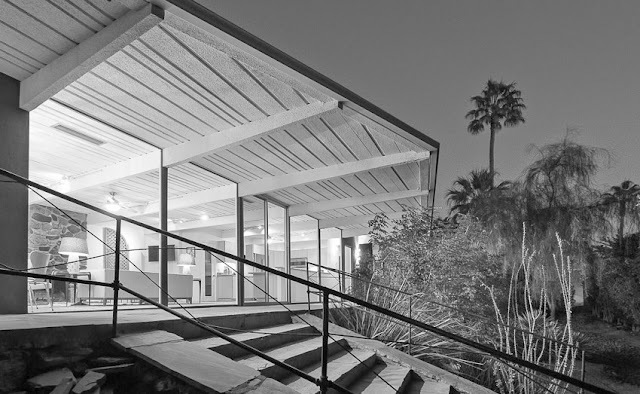 The zig-zag roof appears every so often as you drive the back streets of this mid-century modern city, and could be an option for my home--at a cost. 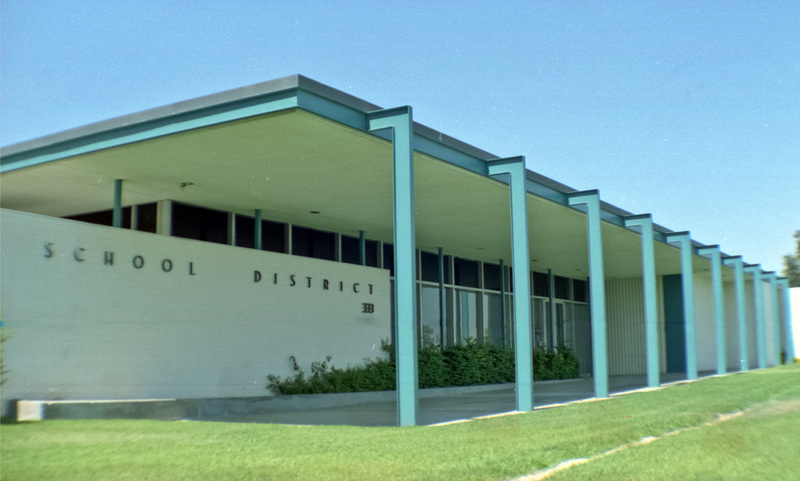 The zig zag form is signature mid-century modern. 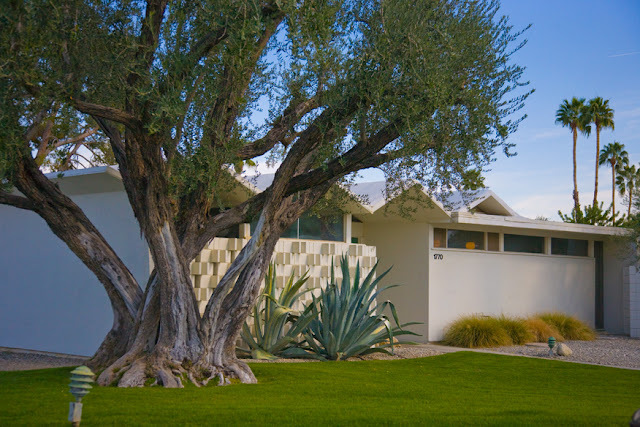 After the sloping butterfly roof, this is the coolest roof style in Palm Springs. The zig zag roof can flipped up and down as can be seen in this image. If I decide on this type of roof it will be the first in the residential part of this neighborhood. However, there is one in the industrial part of the Dumeth Park neighborhood, currently occupied by Vendome Editions on S. Vella Road, northeast of the big park that identifies the neighborhood. Zig-zag roofs can be seen in many cities in the United States. You'll know when you've seen one because of its awe factor, an architectural element that hipster tourists love to see. 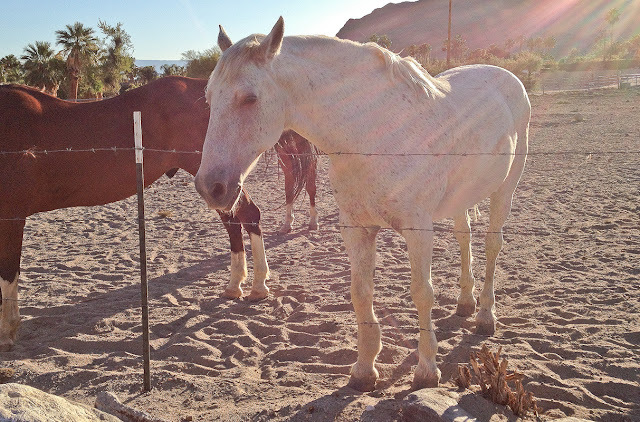 It's bright and early in the Indian Canyons, a great bike ride away from the hustle and bustle of the Palm Springs. If you get there early enough (this image was taken at 7 am), you might catch these friendly horses. Do stop and say hello to them, They'll say hello back. It's been over three years since I've written about Zsa Zsa Gabor and her lovely sisters. Now in her 90s and in ill health, people speculate daily if she's dead yet. The once-beautiful Hungarian celebrity married 8 or 9 times, depending upon who you talk to, hence the title of this post--Eat, Drink and Remarry. In 2011, one of Zsa Zsa's legs was amputated leaving her wheelchair bound. The problem in her leg started after hip-replacement surgery a few years earlier. Today she keeps on keeping on, a vastly different-looking Zsa Zsa than she was in her glamor days. Be that as it may, Zsa Zsa's association with Palm Springs is long and deep. If you want to see where she lived--at 595 W. Chino Canyon Road--drive down South Palm Canyon for a couple of miles and look up the hill. As recent as last month, Gabor's LA home made the news, the social butterfly's primary residence was turned over to her husband to sell. It wasn't Zsa Zsa who moved to Palm Springs first, it was her sister Jolie who owned a busy jewelry store on East Palm Canyon downtown. For those of you who are too young to know what I'm talking about, Zsa Zsa was the world's greatest socialite in the mid-twentieth century and star of a few B movies who ran around in expensive fur and shimmering diamonds saying "dahlink" a lot. You can thank Iconic Palm Springs for the image of Zsa Zsa Gabor's Palm Springs home and rent Zsa Zsa's former home through them for as little as $160 a night. Go 'head have a vacation with the Zsa Zsa spirit. Don't forget your fur and diamonds. The Spa Casino, built in 1960, is truly a Palm Springs landmark with its mid-century modern entrance and tribute to the local Agua Caliente tribe. The image above was taken with a star lens filter to add extra drama to the frame in a nighttime shot. What's remarkable about this image is the star lights up the Indian woman's face so much so that it's clipped (blown highlights or all white area). The effect, although not technically savvy, is stunning, bringing a spiritual effect to the image. This is perhaps one of the most beautiful monuments in Palm Springs, even though little is written about it online and hardly anyone even knows where it is (at the corner of Indian Canyon and Tahquitz Canyon Way). The monument is a tribute to a spring that once flowed through the area. 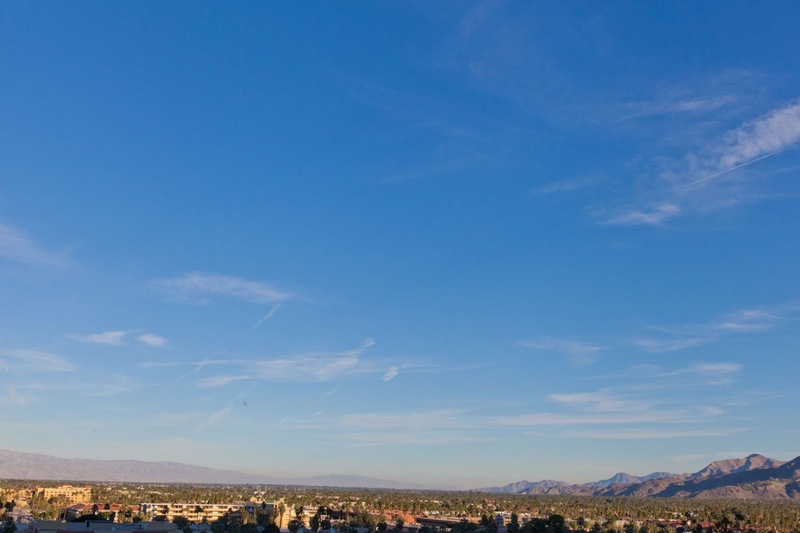 Long before downtown Palm Springs was built, there was a spring that ran from the top of the mountain into the downtown area at that very spot. Palm Springs has a wide assortment of neighborhoods. 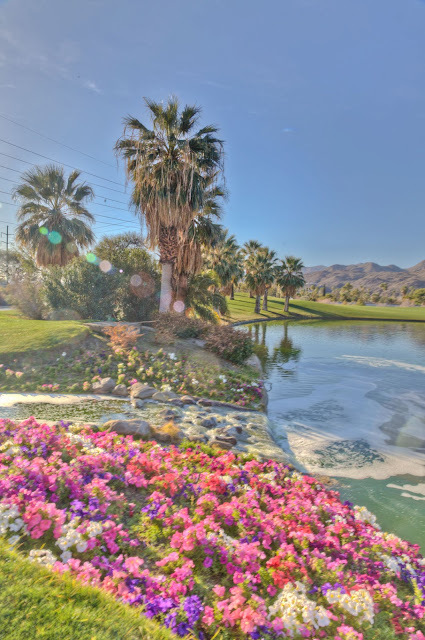 Realtor Dave Stukas has put together quite a video collection of Palm Springs neighborhoods, all of them available on YouTube. If you want to get to know the city, these videos show you quite a bit as the camera moves along the city's side streets. Today's neighborhood is Movie Colony. You'd think with a name like that that movie stars lived there. Indeed, they did and still do. Some of the stars who lived there are Tony Curtis and Cary Grant. If you're old enough, you probably remember these guys. If you're not, Tony Curtis is the father of Jamie Lee, the Activia woman. In addition to the two aforementioned stars, Dinah Shore, Jack Benny, Marilyn Monroe and Al Jolson also lived in the Movie Colony neighborhood. Back in 2011, Marilyn's house in the Movie Colony was for sale for $700,000, quite a deal because it was on the market at the height of the Great Recession. The Movie Colony has two parks: Ruth Hardy Park and the Wellness Park. In the former you can play tennis; in the later you can exercise on a vita-course. Finally, The Movie Colony is within walking distance of the Palm Springs Uptown Arts District, an area where there is a plethora of mid-century modern furniture and accessories stores, many of which supply the LA movie set directors with furnishings and accessories that are featured in first-run Hollywood movies. Could this be the Red Hat Society? No, guess not. That's for women. I got to talk to this chap for a moment while taking his image at the Wells Fargo Bank ATM. He likes hats--red hats. And, as you can see, bright red shirts. 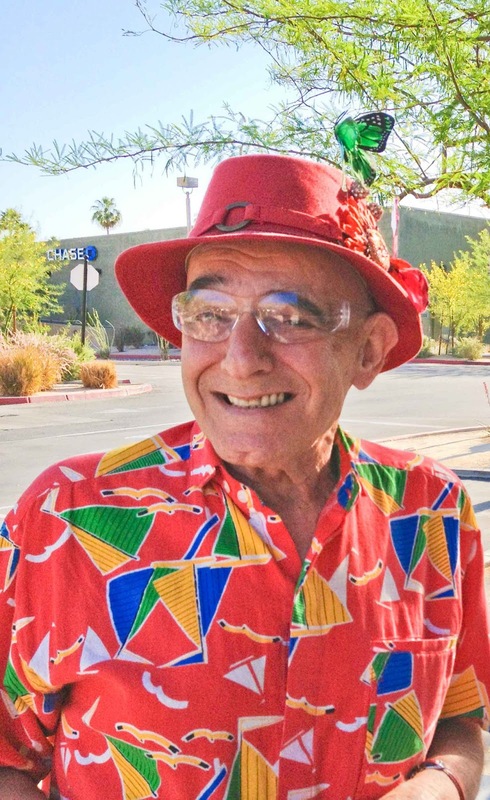 People in Palm Springs can be so festive. Great place to live! Walk around anywhere in Palm Springs and you'll see gardens. Just about every piece of exposed land contains a garden from the medians that break up the streets to the front and backyards of most of single family housing. No where will you find better gardens--colorful annual flowers among water features and Washingtonias--than the golf course. Gardens range from drought tolerant sandy spaces filled with flowering cacti to tropical rainforests under a canopy of banana leaves. Now that summer is coming, we'll once again attempt to figure out how flowering gardens survive temperatures that approach 120 degrees. Any ideas?